Why did no one tell me that the Rhea was such a lovely camo pattern? I’ve admitted before my dark secret. I like camouflage patterns. I have no idea why. This is an IRL problems as well. In the land of sense it may be very silly but in my land of personal taste it is wondrous. Blue is my favorite color. Blue camouflage on my favorite freighter hull. Yes, I have a favorite freighter hull. One that I can now fly. I just need to acquire it. I left Jita the other day when it was full and the gates were not allowing anymore connections. I was already there when I logged in. This may be a time where the players should ask for an increase in Jita’s capacity. 2,300 people may no longer be enough. 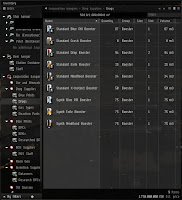 I know that some wish to decentralize Jita and increasing the cap would not help with that. I personally love the Mecca of trade hubs feeling. 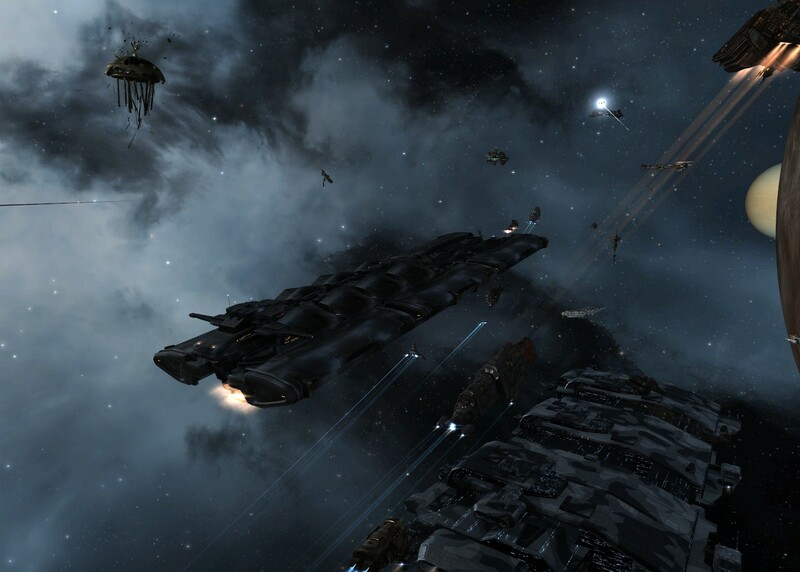 Since I have moved to the Froge I watch streams of freighters pouring in and out of Jita’s gates. I left proudly, with a few million ISK worth of ore in my Orca. My invuls were activated and I floated majestically into space. Then I was bumped a few times. People can't drive worth a damn. Still, once I made it free I hopped out of system and set off to produce some spaceships. Keeping track of it all: And I don't mean spreadsheets. Many people develop alt corporations for various reasons. Sometimes it is as simple as a way to store money. CCP has put up estimates on the wallet accounts for characters but that does not cover the wallet amounts of corporations. To avoid misclicks and mistakes many people keep their ISK stashed away under a layer of the UI on an alt. It means a bit more of a dance to access large quantities of ISK but it also means that when you are looking at the scam contract in Jita for shiggles you don't click accept instead of close. Corporate hangars are a blessing. If you cannot get roles in your corp this is a great activity for that utility alt account. If you are not running an alt account you can still have an alt on the same slot that runs a corporation. Just contract everything to them and then log them in for organization. Corporate Hangars are useful because they are subdivided into divisions. Hangars have a monthly fee but that fee depends on how busy the station is. In a nonbusy station the fee is cheap. Mine is around 10k a month. I make 10k off of high sec belt rats when mining. The more busy a station is the more expensive the corporate hangar. Don’t look at the prices in Jita. Just don’t. The corporate office system has a multiplier on it. As more offices are purchased the price goes up. I can finally write “thanks to the new inventory system”. Thanks to the new inventory system hangar management has improved a lot. With the use of the 7 hangar tabs and containers you can make a very visually organized hangar that helps keep track of all of your items that you are producing. Containers are a wonderful thing and they are what we have instead of extra tabs and such. The new system has all sorts of fantastic filtering tools that I never use. I use containers and the inventory tree to make organizational charts that are visually sensible for me. Enjoying Industry relies a bit on having some enjoyment out of planning. A lot of planning can be accomplished by setup. The initial time sink repays itself time and time again. Ren was peeking into people's hangar's and commenting that fried and I were super neat. Of late my neatness has been taxed. 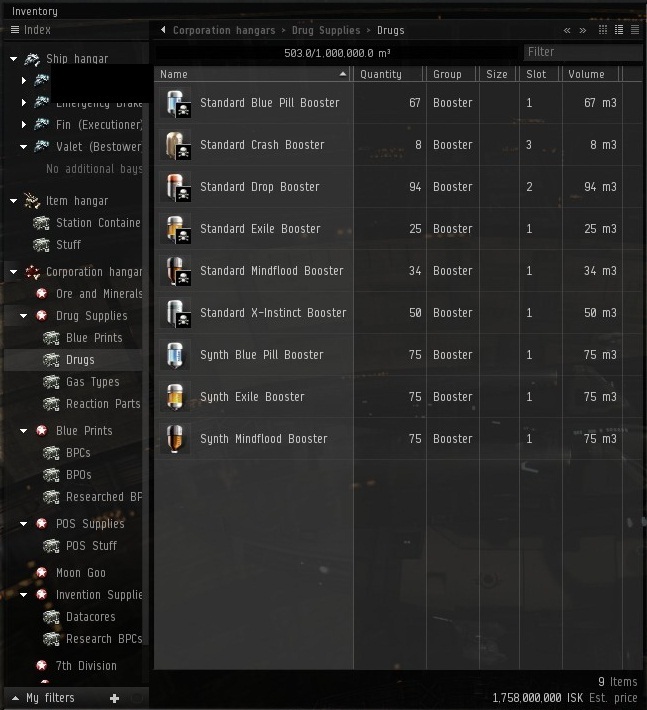 CCP took out NPC sell orders for containers with Inferno and this has made setting up my bases a lot harder. I did some thinking and browsed blue prints and I finally settled upon freight containers as my new container of choice. Giant freight containers hold 120k m3 and condense into 1200 m3 when repackaged. Large freight containers hold 100k m3 and condense to 1000m3. Giant freight containers only cost 5k Tritanium and 5k Pyrite to build. Now that I will be able to do most of my own moving this makes my break down and rebuilding a lot easier for the future. I picked up smaller ones as well. My booster business is doing well. I have not gone out looking for large co tracts. The markets that I have seeded are sporadically productive. I admit I have avoided the ISK wars at the trade hubs. I do not enjoy them. Production is interesting. I am not losing money. I seem to be regaining it but my reinvestment is also increasing as my market expands. I think this is good? My market is player needs. As I supply my own corporation I also start to supply my blue corporations. Knowing me gives them greater flexibility. They can buy one by one or five or fifty at a time. Because we live together the delivery is immediate. It is that desire for immediate delivery that has caused me to steadily increase my on hand supplies. I've had enough requests for synth boosters that I have also started to add them to my list. It is not a market with huge margins. What I have developed is a baseline that I feel is fair. I sell internally just above my cost. This is the the service that I provide to those who are close to me. It can be considered a side effect of socialization . I have no interest in lining my wallet off of my friends. I well know the expenses of living in Low sec. At the end of last month I noted that we had exploded more than ever before. With that comes cost. Cost means ISK. Through plex or play the acquisition and expenditure of ISK is a never ending story. I'm a bad business woman but I derive satisfaction in knowing the boys will use their boosters and not hoard them due to financial constraints or supply worries. The reinvestment side has been slow. I have not done something like dumped a large part of my liquid ISK I to the project. Slow but steady with a focus on having supplies on hand. Once I learned the general usage patterns I have started to put excess on the market in small batches. I started with around 500mil in made boosters sitting around. Now I have around 2 bill in hangar with another 2 bil on the market and then depending on how much gas I have to react that is easily another bil or two. This is where I feel poor money wise when I actually have ISK out in raw assets. lol You have an aggregate 4B gross worth, and you're saying you're space-poor? Wow. lol. I wanna be that kinda space-poor too!